Too much salt in a person’s diet can lead to high blood pressure, heart attacks, strokes, and heart disease. As a general rule the USDA and ChooseMyPlate.gov suggest consuming less than 2,300 mg of sodium a day, which is one teaspoon of salt. They also suggest that Adults age 51 and older, African Americans of any age, and individuals with high blood pressure, diabetes, or chronic kidney disease should further reduce their sodium intake to 1,500 mg a day. 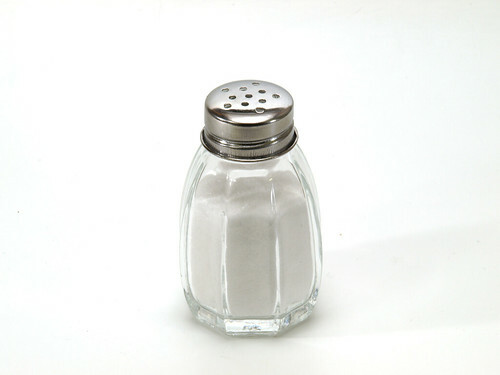 Take a moment to reflect on your sodium intake, are you consuming too much salt? If you are then there is no time like the present to make a change. Consider the following ways to cut back on your daily salt intake. Reduce Salt in Cooking – I love cooking because I get to control what I put in my food and body. Reducing salt while cooking is an easy way to cut back on sodium intake. Salt is used to bring out flavors, which is good, but we can go overboard. Taste buds take a bit of time to adjust but you’ll find that, in time, scaling back little by little makes a big difference. When I am cooking (not baking) I don’t use salt at all. I find that some foods like canned beans or vegetable broth have enough salt to flavor the dish. Try New and Flavorful Spices – Replace the salt with a new flavor by adding spices, cutting out sodium doesn’t have to be boring. As a bonus, a lot of spices like oregano, garlic, rosemary, and cinnamon benefit your health. Avoid Canned Vegetables – Fresh and frozen fruits and vegetables don’t have added sodium like canned vegetables. I think fresh and frozen taste better too! Save Salt For Last – Taste you food at the end of cooking. If your soup is a little bland then you can add salt. You can always add salt but you can’t take it out. Take a Look at Labels – 77% of salt comes from processed and restaurant foods. It’s easy to select lower sodium foods in the grocery store. Most stores offer a variety of brands. Pause a moment to compare labels, look at sodium content and what ingredients are in the product. This will help you stay away from more processed foods. When dining out, some restaurants will indicate lower sodium options on their menu or do a little online research with the restaurant’s online menu / nutritional facts before you go. Use a Food Log – Websites and apps can keep track of what you eat, they can also tell you when you’ve reached your sodium limit. It’s very helpful. Reducing salt intake to safe levels will help to improve health. Have you reduced your salt intake? If you have, have you noticed a difference in your health or mood? If not and plan on cutting back, how are you going to approach it? I’d love to hear your thoughts.